2Chongqing Youth Vocational and Technical College, Chongqing, China. Received March 7th, 2011; revised April 18th, 2011; accepted May 22nd, 2011.
from online communication than do girls. about new emerging technologies and their developmental stage. adolescents’ existing friendships and their well-being. significant predictor of users’ subjective well-being. 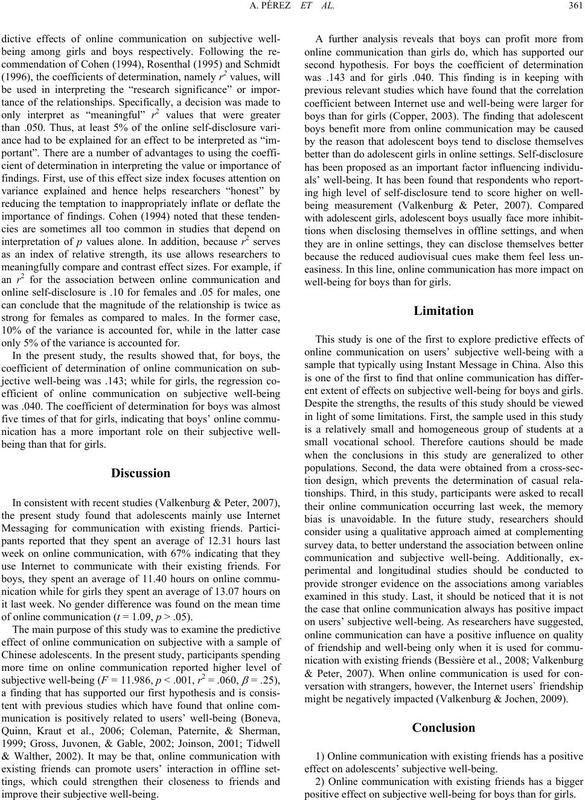 tween online communication and subjective well-being. friendship were supported by some studies (Kraut et al., 1998). for boys than for girls. from a small vocational school in the southwest area of China. demographics represent the student population at this school. Descriptive data for online c ommunication and subjecti v e w el l -being. day; 3) on both days; and 4) I do not use QQ on the weekends. than 9 (Vander Voort & Vooijs, 1990).  11.03 hours/week; t = 1.09, p < .05) (please see Table 1). QQ for communication with existing friends. a positive predictor of online self-disclosure. million, possibly making it the world’s largest online community. only 5% of the variance is accounted for. being than that for girls. 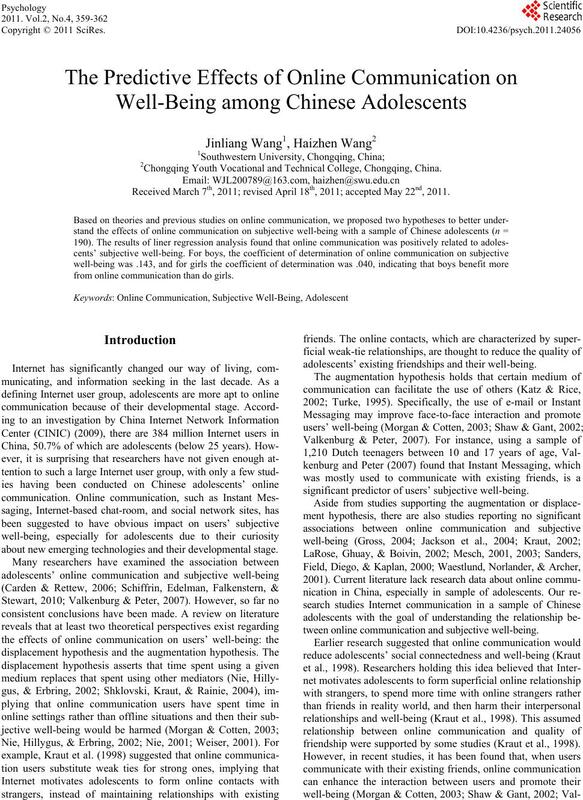 of online communication (t = 1.09, p > .05). well-being for boys than for girls. ent extent of effects on subjective well-being for boys and girls. might be negatively impacted (Valkenburg & Jochen, 2009). effect on adolescents’ subjective well-being. positive effect on subjective well-being for boys than for girls. for their valuable suggestions on the manuscript. net use. Computers in Human Behav ior , 19, 71-80. American Psychol ogical Asso ciati on (5th ed.). Washington, DC: Author. rent Directions in Psych ological Science, 11, 7-10.
tion, Communication, and Society, 11, 47-70.
with life, and loneliness. Psychological Reports, 98, 121-122.
munication. Computers in Human Behavior, 15, 51-65. Los Angeles, California: Alliant International University. in adolescence. Journal of Social Issues, 58, 75-90.
the digital divide. Comm uni ca ti on s of the ACM, 47, 43-47. 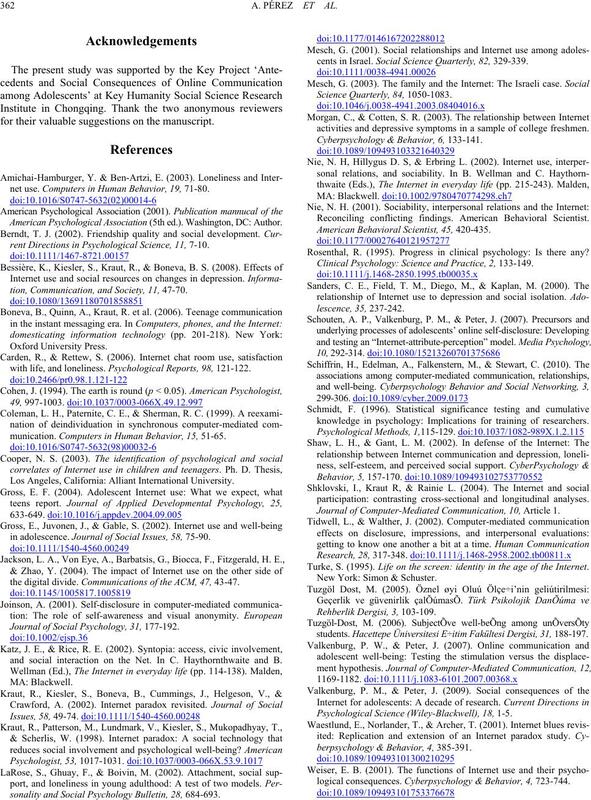 Journal of Social Psychology, 31, 177-192.
and social interaction on the Net. In C. Haythornthwaite and B.
sonality and Social Psychology Bulletin, 28, 684-693.
cents in Israel. Social Science Quarterly, 82, 329-339.
activities and depressive symptoms in a sample of college freshmen. Cyberpsychology & Behavior, 6, 133-141. Reconciling conflicting findings. American Behavioral Scientist. American Behavioral Scientist, 45, 420-435. Rosenthal, R. (1995). Progress in clinical psychology: Is there any? Clinical Psychology: Science and Practice, 2, 133-149.
knowledge in psychology: Implications for training of researchers. participation: contrasting cross-sectional and longitudinal analyses. Journal of Computer-Med iat ed Com mu nic ati on, 10, Article 1. Turke, S. (1995). Life on the screen: identity in the age of the Internet. students. Hacettepe Üniversitesi E÷itim Fakültesi Dergisi, 31, 188-197. Psychological Science (Wiley-Blackwell), 18, 1-5.
berpsychology & Behavior, 4, 385-391.
logical consequences. Cyberpsychology & Behavior, 4, 723-744.